I am extremely excited to announce that I have partnered up with Pledge 1%, a corporate philanthropy movement to formalize my impact on the community. Prior to formalizing my philanthropy efforts, I gave back regularly, but I was not intentional nor was I consistent. Just like in personal finance, you can make a bigger impact both personally and on those around us by being more intentional with your actions. That is really where I see this being a game changer for me and my firm. My clients also get to play a part in my commitment. Level Up Financial Planning commits to donating 1% of net profits each year toward charitable organizations that are voted on by clients. As a way to add fun and tangible value to my clients’ financial planning experience, we recently launched Level Up Achievements. Level Up Achievements will be awarded to clients based on major life events and accomplishing major financial objectives that directly impact their ability to achieve their most important goals. 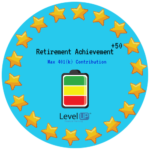 Each achievement type will receive various points and at the end of the year, clients will use their points to vote on the charitable organizations they wish to receive Level Up’s contribution. 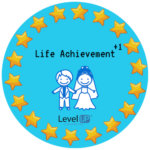 Achievement awarded to recently married couples. Achievement awarded for individual that maxes out 401(k) contributions. 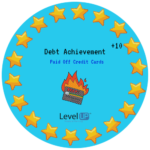 Achievement awarded to clients that successfully pay off credit card debt. I still enjoy actively giving back within my community, but have paused those activities while my family and I adjust to being a family of four. Financial education for non-profit groups– Financial education is something I am very passionate about and I understand that many do not enjoy discussing finances or never had the opportunity to learn about personal finance. I look forward to being able to use my passion to make a huge impact on those who attend. Feel free to reach out if you know of a non-profit group or organization I can be a guest with. Running events for a cause- Running events have a tremendous amount of energy, I get so hyped up even as a volunteer on the sidelines. If you know of an event in Northern Colorado, I would love to plan and try and incorporate the event into my plan. I know it is extremely hard to find time in our busy schedules to squeeze in one more thing, but I guarantee you it is possible, all you must do is be intentional. Some employers even provide paid time off that allows you to get out of work and still get paid! In case you are ready to dive in but don’t know where to find opportunities here are a couple of organizations that you may have locally to help you find an opportunity that fits your schedule. Or you can always reach out to me and tag along if you happen to live in Northern Colorado!